What a scorcher! We started out prompt at 8.55am to get some miles behind us before the heat of the day. 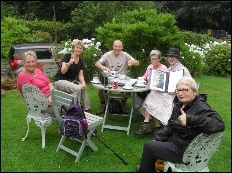 At Fish Hill we were thrilled to be joined by Jan and Chris from Pershore IW who walked into Broadway with us for some lunch. 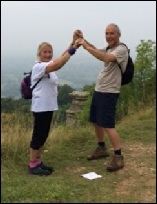 Then Banbury member Alison and husband Martin joined us for a few miles. Two tumbles today but luckily no injuries sustained! Very hot and bothered by the time we checked into the hotel at 5pm. 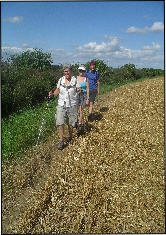 Another hot day for walking but we made good time arriving at Winchcombe for lunch at midday. On our way we spread some International friendship with a nice chat with four Belgian ladies. Fortunately the sky clouded a little in the afternoon making our final climbs easier. We took no chances today after some serious dehydration issues yesterday! meant over an hour’s walk to find the path! 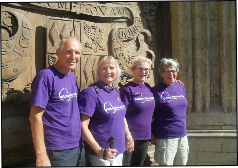 We had fantastic support from Marg (Worcester Severn IW) and Margaret & Moira (North Wiltshire IW) who walked with us today. It was tough all the way with high humidity and the only pub en-route with a closed kitchen. Our saviours were a lovely couple who provided coffee and teacakes on their lawn! The romantic highlight was a visit to ‘Devil’s Chimney’ - the site of an historic marriage proposal 31 years ago. It took until 6pm to get to our very welcome baths tonight. 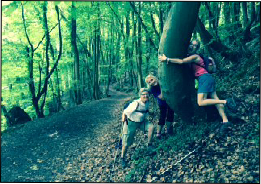 A lovely sunny day and lots of woodlands to keep us cool, making it more comfortable to cover our miles. Our lunch stops don’t just give us a chance to re-fuel but also to re-plaster our feet for protection! 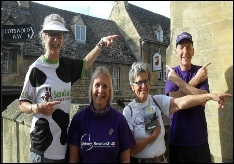 We were joined by Marg again for the morning and also Wendy, D10 Secretary (Stroud IW) who not only walked but also met us at 6.30pm and drove us off the path and into our hotel - what a star. The afternoon saw us confronting a herd of cows determined to walk down the path towards us. Clare soon sorted them out! 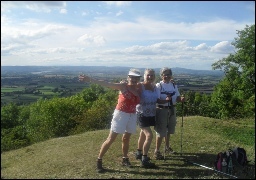 Fabulous views from our high points all the way to the River Severn and the Malvern Hills. A tricky start to the day when our valiant luggage driver, Stephen’s car broke down just as he dropped us at our start point. Luckily the AA came to the rescue and we then got underway. A long haul up and down hills but lovely views to reward us and more peaceful woodlands to explore. We managed to dodge all the expected rain showers but heard the thunder rolling around us. Banbury Club President, Helen came to meet us at Dursley for a late lunch and then we had a short afternoon before being collected and driven to our hotel by Annie’s husband, Martin who is on duty over the weekend! After missing dinner last night and going to bed with dehydration & exhaustion Linda was glad to be up and about this morning. 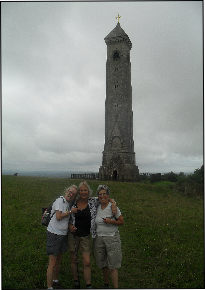 We romped uphill to the William Tyndale monument and then down again into Wotton Under Edge for coffee. 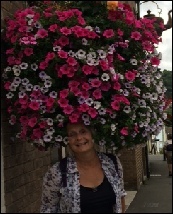 The DC admired the hanging baskets and wondered if she had found a hat fit for the Rally! Nowhere else to get food today so we stocked up and then made our way through country lanes, fields and more woodland, once again dodging all the showers. Paused for our sandwiches on a bench in the hamlet of Alderley and then the sun came out as we climbed more hills and descended into Hawkesbury. Our shortest day so far but more to do tomorrow. What the photos do not show is the aching feet and legs or the number of painkillers now being consumed daily! We set off early at 8.30 for another long day. Lovely sunshine and our route today took us along much easier ground, only a few climbs and lots of fields and meadows which were fairly level. It made a big difference to the legs! We paused for a drink at Old Sodbury and then lunch at a pub in Tormarton. After making good time we sneaked an ice cream at the NT property; Dyrham Park. Annie put her feet up while we rested in the shade. We then had to detour off the path to find our farmhouse B&B for the night and Dave heroically navigated us safely across fields of cows! Driving out for our last dinner this evening to set ourselves up for the final push into Bath tomorrow. Awoke to more glorious sunshine and another great breakfast. We walked without a stop all day across fields and the last of the countryside until we reached the outskirts of civilisation. A final climb in Bath and then descending past the Royal Crescent and into the city centre. What a wonderful surprise to be met by Hildegarde, President of Bath IW and our very own MOC, Anne who had travelled from Wokingham to greet us at the finish. 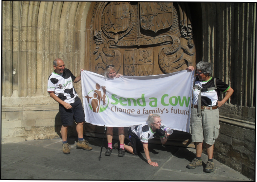 We were joined too by Tom from Send a Cow’s HQ in Bath, who arrived in time to see us kiss the Abbey doors - a sign that our journey was over! Ladies should never do more than perspire a little but we have sweated buckets over the past eight days! We couldn’t have done it without the support of three tremendous husbands who have transported our luggage or walked and map read along the way, or without the moral support and friendship of so many IW friends, particularly Clare who has walked the whole route with us. If you haven’t added your name to one of our sponsor forms yet - it is not too late! 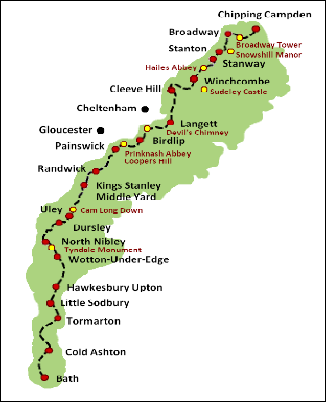 Please make cheques for sponsor money collected to ‘District 9 Inner Wheel’ and write ‘Cotswold Way’ on the back. Thank you.